There's only one kind of Super Bowl party -- one with no fancy food, only dishes that are messy and scrumptious. 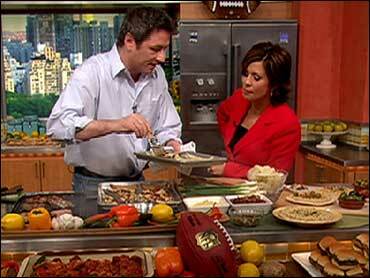 The only rule, says chef David Walzog, is that there aren't any rules -- no penalties at his Super Bowl parties! On The Early Show Thursdsay, Walzog, who's executive chef at the SW Steakhouse at Wynn in Las Vegas served up the game-day favorites he made for his own football party -- when his beloved Baltimore Ravens took part in this year's playoffs. They lost, but his menu scored touchdowns with all his guests. Walzon was born in Baltimore. He says this is a fun time for chefs! When making the sliders, Walzog says, instead of trying to place a bunch of toppings on the tiny burgers, mix things directly into the meat. Also, rather than forming little patties, roll out the meat very thin, then cut it into squares. That keeps it from puffing up while cooking and looking more like a meatball than a burger. Season the chicken thighs with salt and black pepper. Heat a large saute pan on the stove top, add 3 tbsp canola oil and add the chicken thighs, skin side down. Allow to cook until the skin begins to crisp and is golden brown. Flip and cook the chicken for an additional 2-3 minutes. Remove the chicken and set aside. Next, add the sausage into the pan and brown. Remove when brown. Reduce the heat of the pan to medium and add the peppers, onion and garlic. Cook until soft, about 6-7 minutes. Add the tomato sauce, lemon zest, basil and chile flakes; bring to a simmer. Cut the sausage links into 1-2" chunks. Place the chicken and sausage into a baking dish and port the tomato sauce mixture on top. Cover the baking dish and place into the preheated oven and cook for 60 minutes. 1 Pkg Prepared Pita or flatbreads. Grill the flatbreads either on an outdoor grill or indoors using a grill pan until crisp and toasted. Generously spread the artichoke puree onto the grilled flatbread and top this with *grated* baked cheese. Either scatter the olives onto the flatbreads randomly, or set the olives out in small bowls for guests to build their own. When crisp add the cheddar cheese and crisp bacon. Place into a 375 oven and bake for 10-15 minutes until the cheese is melted through. Sprinkle with the pickled jalapenos. In a mixing bowl, add the ground beef, crumbled bacon and grated cheddar. Mix well to combine, Season with kosher salt and ground black pepper. Place the beef mixture onto a lined baking sheet. Place a piece of parchment on top of the beef and roll out the beef to ¼-1/2" thick. Let chill before cutting into 3"x3" squares. In a mixing bowl, add the ground beef and crumbled Blue Cheese. Mix well to combine. Season with kosher salt and ground black pepper. Combine all of the ingredients and place the turkey mixture onto a lined baking sheet. Place a piece of parchment on top of it. Roll out this out to ¼-1/2" thick. Let chill before cutting into 3"x3" squares. Grill or pan fry, about 1.5 minutes a side - because the patties are so thin, they won't need much time to cook through. Place on buns and serve.